The amount of a product obtained is known as the yield. 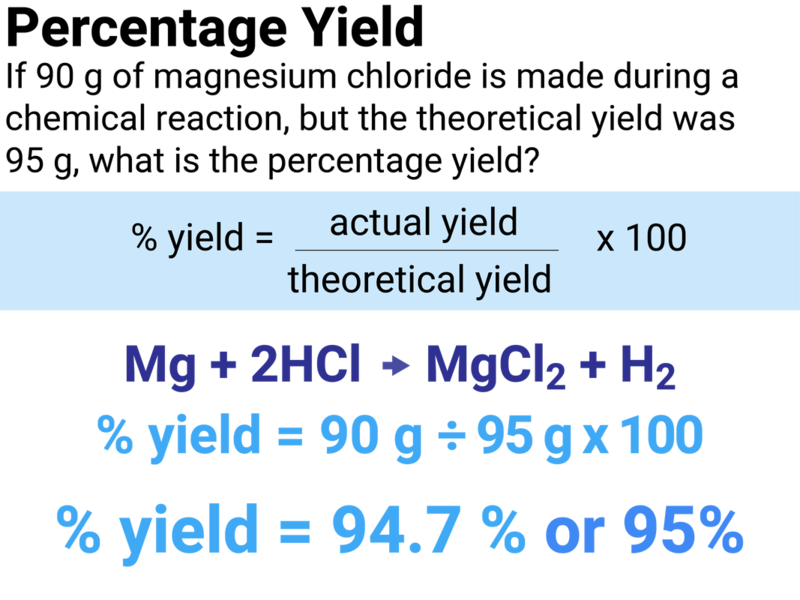 When compared with the maximum theoretical amount as a percentage, it is called the percentage yield. The atom economy (atom utilisation) is a measure of the amount of starting materials that end up as useful products. 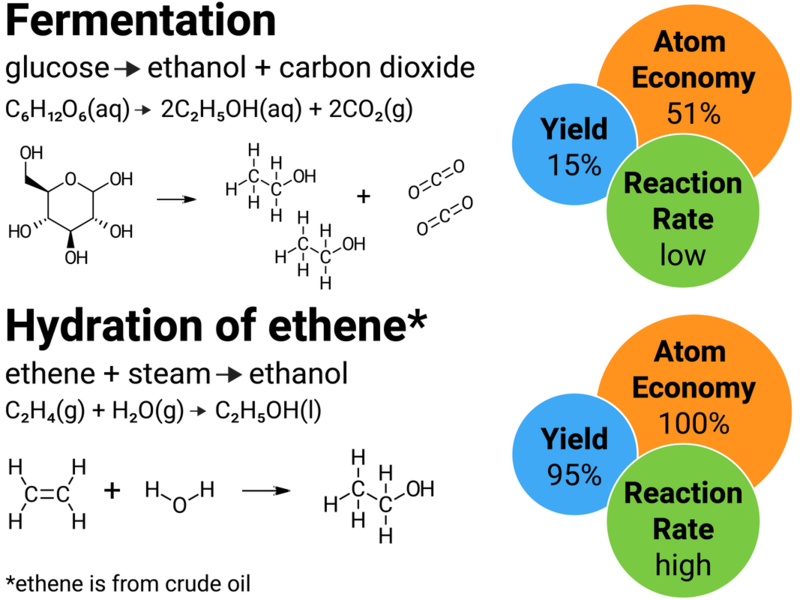 It is important for sustainable development and for economic reasons to use reactions with high atom economy. 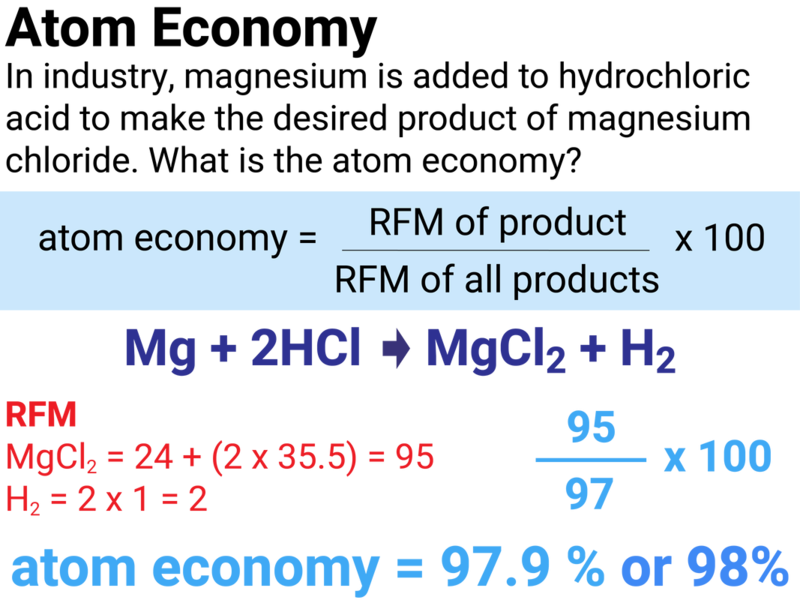 If we have a high atom economy, then the majority of the atoms we put into the equation are what we get out! A reaction that only produces one product, will have a 100% atom economy. Usually, there is more than one way to make a particular chemical. A reaction pathway describes the sequence of reactions needed to produce the desired product. The units for concentration are mol/dm3, but they may also be written as moldm-3 - don't worry as these mean the same thing. You need to be able to calculate concentration in gdm-3 and be able to convert these units into mol/dm3. For example, a solution of sodium hydroxide has the concentration of 5 g/dm3. To convert it into mol/dm3, we divide 5 ("the mass") by 40 (the Mr of NaOH). This gives a concentration of 0.125 mol/dm3. 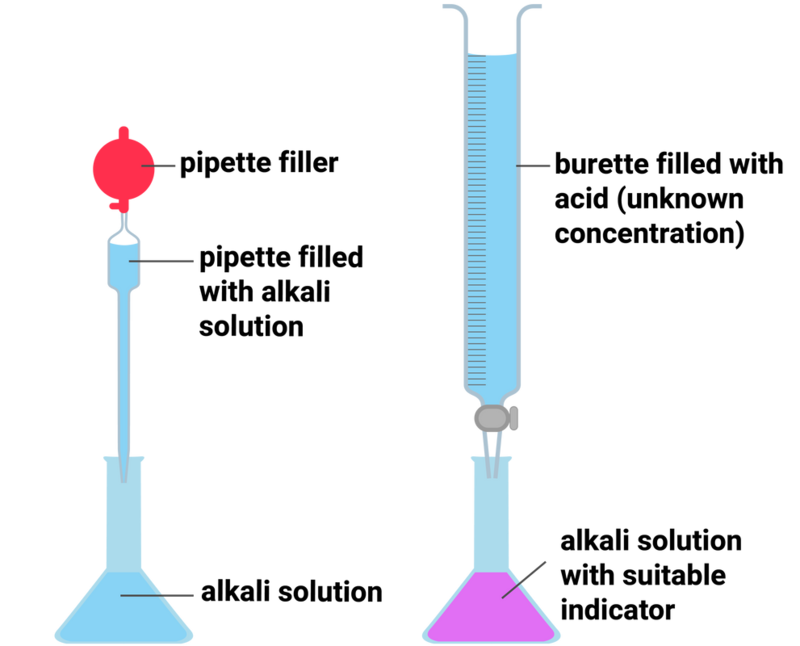 During a titration, 25 ml of sodium hydroxide was used to neutralise hydrochloric acid. This is the same as 0.025 dm3. 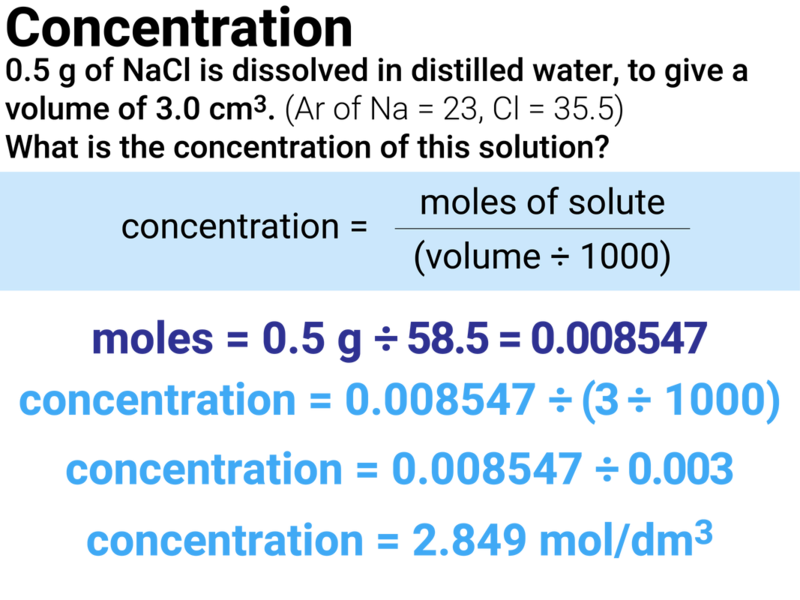 If the concentration of the alkali is 0.12 mol/dm3, then the amount of moles used is 0.025 x 0.12 = 0.003 moles. If hydrochloric acid (unknown concentration) completely neutralises the alkali then we know that 0.003 moles of acid were also present (because the balanced symbol equation shows a 1:1 ratio of acid reacting with alkali). If 26.8 ml of acid were needed to neutralise 25 ml of alkali, we know 0.0268 dm3 acid were used. When completing a titration, you will have multiple readings which you need to calculate an average reading for. It is important that the titres you include in your calculation are concordant. If they are not, you will lose marks in an exam. Below are some results from a titration experiment. The average titre for these results would only include the values from run 1, 2 and 3 as these are the only concordant results. Avogadro's law states that equal volumes of different gases contain an equal number of molecules (this only applies at room temperature and pressure, 20°C and 1 atmosphere pressure). 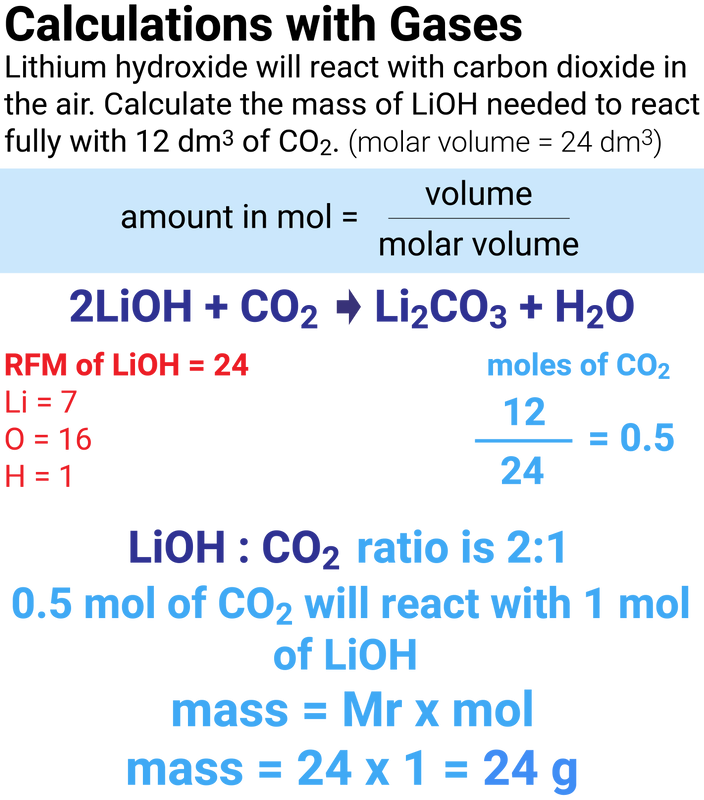 The molar volume is the volume occupied by one mole of molecules of any gas at room temperature and pressure. The molar volume is 24 dm3 or 24000 cm3. 5.0 g of sodium reacts fully with water. Calculate the volume of hydrogen produced. If sodium completely reacts with water, then we know that 0.217 moles of sodium will make 0.109 moles of hydrogen (because the balanced symbol equation shows a 2:1 ratio of sodium reacting to make hydrogen).